“Gary is a prodigious interpreter of Palladio for the American taste. Like Julia Child did for French cuisine, he teaches us things about Italian architecture that we thought we knew, but only skin-deep. Gary takes us down to the beating heart of Andrea Palladio, and the half-millenium of architectural taste since then. Like risotto with white chocolate, his talks are both savory and sweet. Not to be missed! Given the task, last minute to stir the pot, it was a test of endurance setting the tone of the evening. “Palladio Risotto was born from a summer vacation in Vicenza while Gary was in architecture school. There, he developed an interest in the work of the architect Andrea Palladio and became passionate about the intersection between Palladio’s architecture, the stories of the clients who hired him and the lives they led - especially their food, and especially arborio rice, the main ingredient of the famous Venetian dish, risotto. Gary has completely immersed himself in the visual beauty and the history of Palladio and the buildings he designed in the Veneto as well as his far reaching influence in architecture throughout the world. Palladio/Risotto is an entertaining, visually rich presentation that introduces the beginner to the work of Palladio and provides depth and nuance for serious students. Perhaps best of all, is the preparation of a risotto while he speaks so that you can immerse all your senses in the world of Palladio’s Veneto. The talk is fun, beautiful and delicious. It’s well worth bringing Gary to speak to your group. “I met Gary some years ago, and I'm sure of one thing: he is the most amazing epicure or connoisseur of the Palladio subject. Gary knows every single Villa designed by the famous Italian architect. He knows every detail, every material, all the story behind the scenes. It is a pleasure to hear Gary talking about Palladio and all the adventures that Gary had over many years, visiting Vicenza, the town where you can find the most amazing examples of Palladio architecture, visiting Veneto and visiting Italy in general to find inspiration, beautiful raw materials (like stones or bespoke items) for his own projects. I followed Gary in several Palladio talks and every time I've heard something new, like a surprise for me and all the audience. Palladio made several discovers in the Architecture field, and he has been a genius of the Architecture like Leonardo da Vinci was a polymath of the Renaissance. Gary, in a delightful hour, is capable to abridge a very long story of the most beautiful of the eighty-eight projects designed and built by Andrea Palladio in less than forty-five years. “Gary Paul introduced me to the genius of Andrea Palladio. I had the privilege of taking his Palladio tour from Milan to Venice in the spring of 2017. His extensive knowledge of the architect and his work transcended time and place. Exploring the Villas of the Veneto with Gary was magical. Classical Roman principles permeated the places we visited and Gary shared his educated and learned intimacy with the buildings and their creator. 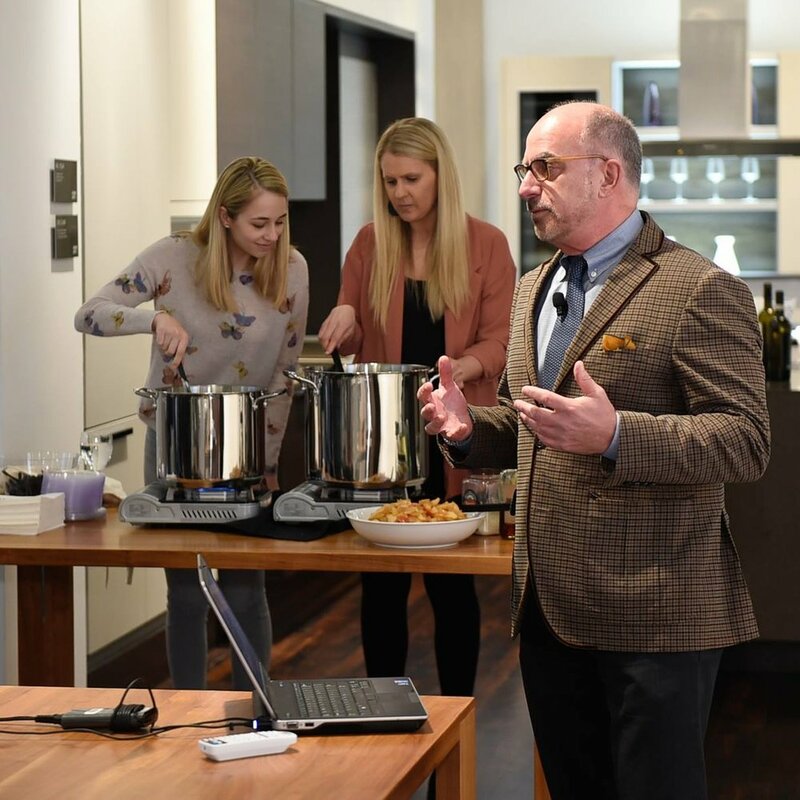 Gary Paul, delighted ICAA NoCal this past fall when Palladio Risotto was presented in San Francisco to a large gathering of classical architecture enthusiasts. Slides, anecdotes, humor and delicious risotto combined to make this unique evening a memorable, fun and informative glimpse into the power of Palladio!" "Touring the Italian countryside with Gary Paul was an intense immersion into all things Palladio. I had no idea there were so many exquisite examples of Palladian architecture available for touring. Some (by luck and by Gary's careful planning) not normally open were toured by my husband and myself in our week long trip. Via Gary's deeply informed tutorials we gleaned a sweeping sense of time and place, culture, and history."